Here is yet another CTF map! It has a rather simple layout and is intended for CTF (for up to 5v5). I updated the first post with a new release, metro_r1a, and I added a changelog. In a future release, I'll try to add a third entrance to the base on top of the escalators (probably through a broken elevator shaft, as packer suggested). By the way, does somebody know why the water in the flag room is transparent? The water should have this dirty brown-yellow color, as seen on the first post. I compiled the map with default Xonotic settings. Yay thanks, I will try that. I updated the first post with a new release, enjoy! Nice work, will load it up on Kansas. I kinda feel like that area underneath the bridge with the 2 tinfoil teleporters is a bit... lacking. Not sure if it should have another room, or just another way back up to the top, but the teleporters look a bit out of place. The current teleporters are indeed a bit out of place, I plan to improve them in a future release. Running on elements ctf server. Lets see if it's liked!!! Look nice SpiKe great work! I can't believe I haven't posted on this yet! Very good job! It is by far your best CTF map which means you are improving yourself all the time (this is a kind of legacy Xonotic mapping scene wants). Map: The tunnels seems slightly over-scaled but this might be just a false feeling (perhaps the metro wouldn't fit if you shrinked them). The atmosphere is present and good but could be more profound (with stronger lighting contrasts, more color depth (lighting, not textures) and slightly more 'destruction'. Don't be afraid to 'spoil' some stuff and remember that as long as you clip it there shouldn't be a problem!) You could try adding more sand here and there and you could perhaps want to convert all the terrain pieces into meshes (less polygons and better results + vertex blending which always look good) . Good job for using the planks, they add to the 'old' atmosphere. Maps layout is simple and original, there is some verticality but not so much. You added different heights for different rooms however you slightly neglected the power of platforms... Although in this case (large CTF map with original layout room-corridor like) I wouldn't worry about things like that so much. There are already some ramp jumps and height differences which should be just enough for players to enjoy! I'm also trying to add more verticality by adding a room on top of the escalators, and connect it to the underground corridors with an elevator shaft. Hi I signed up because I wanted to download this map. It looks great! - Re-arranged the direction panels in the corridors. - More details, the metro station should look more abandoned. - Tweaked spawnpoints a little bit. Screenshots and download link are up-to-date in the first post. This metro is out of order for a long time. Maybe adding some plants and more destruction here and there? Check how Cortez is making this for he is very good at making loose tiles, terrain, damaged walls, etc. I feel like the meto train cannot be made of stone and concrete, I would strongly recommend metal. Try to diversify its shape. It's good as it is but could be better. I can imagine how irritating it is to bump constantly into those.. Maybe I lost me movement skills but I just keep on hitting them! I also eagerly await the completion of this very very cool map! Thanks a lot Justin, BuddyFriendGuy and Cortez666 for your comments & feedback! (08-04-2016, 03:33 AM)SpiKe! Wrote: The most tricky part will be the trains. I'm kinda limited by the Xonotic texture set here, but I'll try to make them look better (and less "concrete"
i know that you are limited there, but thats not really an issue. The Venetian Las Vegas Casino has an indoor sky. It looks very realistic. The ceiling is actually shaped similar to the subway tunnel. 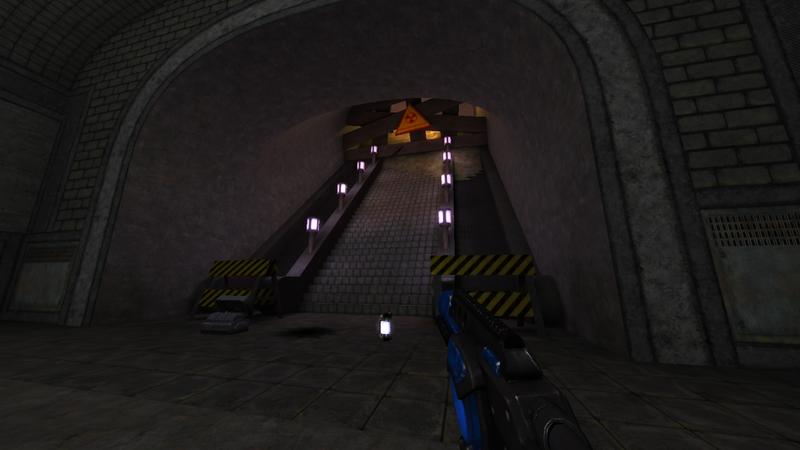 Last release for this map, METRO_R1d. The download link is on the first post, as well as updated screenshots. Resized some parts of the tunnels in order to remove weird clips around the trains. Removed a lot of unneeded and annoying clips (invisible walls, etc.). Added a few environment details. Used a better font for the signs (based on the Xolonium font). Since you unclipped these areas, maybe make the center teleporters exit somewhere from deeper up there?